The resort has a lovely, landscaped courtyard with many green grassy knolls, palm trees galore, and flower lined red brick paths that lead to each of the condo towers. The resort has a beautiful beach front swimming pool and two other pools towards the back of the courtyard. You can relax your muscles in the Jacuzzi, play a game of volleyball on the sand court, or have a great workout in the ocean view fitness center. A 308 is on the 3rd floor and can accommodate up to 6 guests with all of the comforts of home. The living room is comfortable and contemporary. 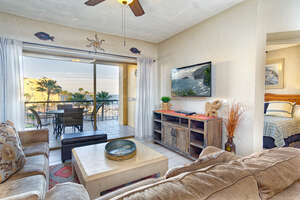 It is furnished with a sofa hideaway bed and love seat, a wall-mounted flat screen TV, DVD player, and DIRECTV. The resort is set up with high speed wireless internet so your laptop will work anywhere on the premises. The dining area has a beautiful hand-carved table with seating for four while the kitchen counter accommodates three more with bar stools. The kitchen is fully furnished with everything you need for cooking and entertaining. Hint: Bring charcoal and lighter fluid so you can grill fresh jumbo shrimp purchased at the Old Port! Gallons of purified drinking water are provided for your stay. 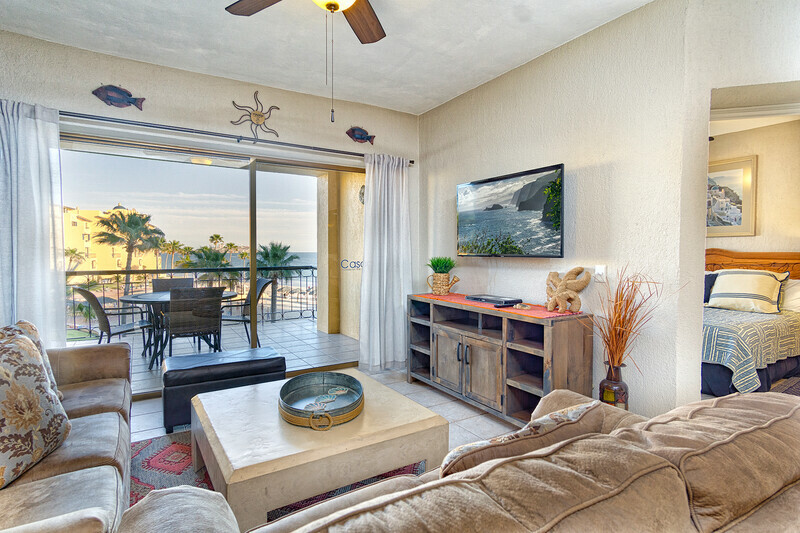 The master and guest bedrooms are both furnished with comfortable queen-sized beds, TVs, ceiling fans, and closet space. You will find the terrace to be your favorite spot with spectacular views of the property, the Old Port, and the sea where you often have easy viewing of playful dolphins. Please make yourselves at home in our home! 11/20/18 03:23pm Scott The place is perfect! Thanks so much for a wonderful time! 04/12/15 11:41am Nydia The food and beverages were very delicious and served in a very timely manner. Colins Cantina at Princesa de Peñasco. 11/11/14 08:30am Dug Your service is always great and staff is very friendly.